It’s virtually impossible to imagine the life of a modern man without a car. When you own a car (or are just thinking of getting one), you need to take care of the place you’re going to keep it in. Sure thing, we talk about garages, but what about the door? You have to think not only about the inner space, but about the garage door size as well. Americans use the garage more than any other entry to the house, including the front door. Read further to find out how to choose the best size for your future garage door. This article will also help you to measure garage doors properly and avoid common mistakes people make. To get the perfect garage door, you need to make the proper measurements. What exactly do you need to measure? 1. The width and height of existing garage door opening. These are the most important measurements. The room for drive through depends on the width and height of the opening, so pay attention to it. This also determines the size of the door you’ll need. Keep an eye on possible defects, such as an uneven opening or un-level floor. This is the space between the ceiling and the top of the door opening. It’s important for fitting sectional garage door tracks or placing a curtain roll for a roller shutter garage door. 3. The width of the side room on both sides of the door. You need this measurement to fit the door frame and the door mechanism properly. This measure requires up to 3.75” on each side. If you’re dealing with a double garage door, make a 10” wide center post. 4. The depth of the garage. 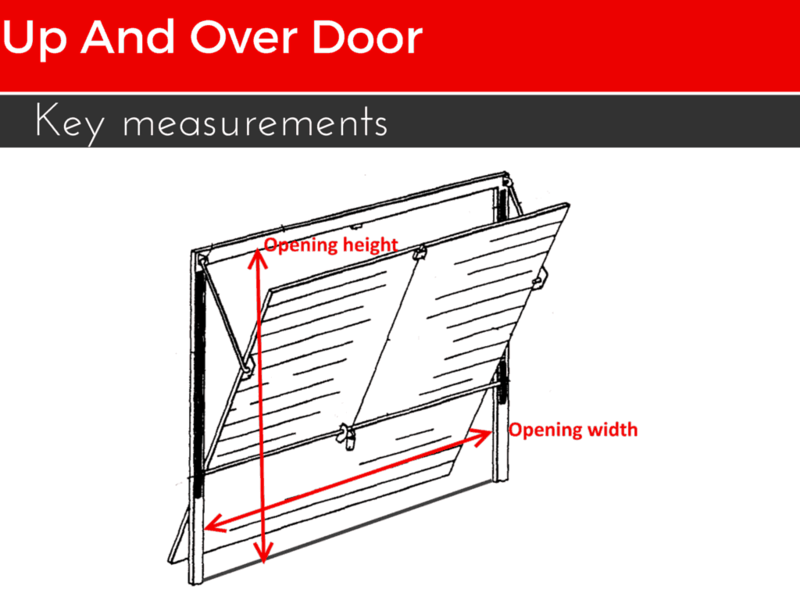 This is a necessary measurement for an up and over, sectional or side hinged door that opens inside. You need to have enough room for the door to open properly. 5. Consider all the obstructions when measuring. What can be an obstruction? Pipes, lighting and nearly anything that interferes with the door track. When you’ve done all the needed measurements, it’s time to choose the door size to fit your car (or cars). The typical sizes for single garage doors are 8’ x 7’, 9’ x 7’ and 10’ x 7’. 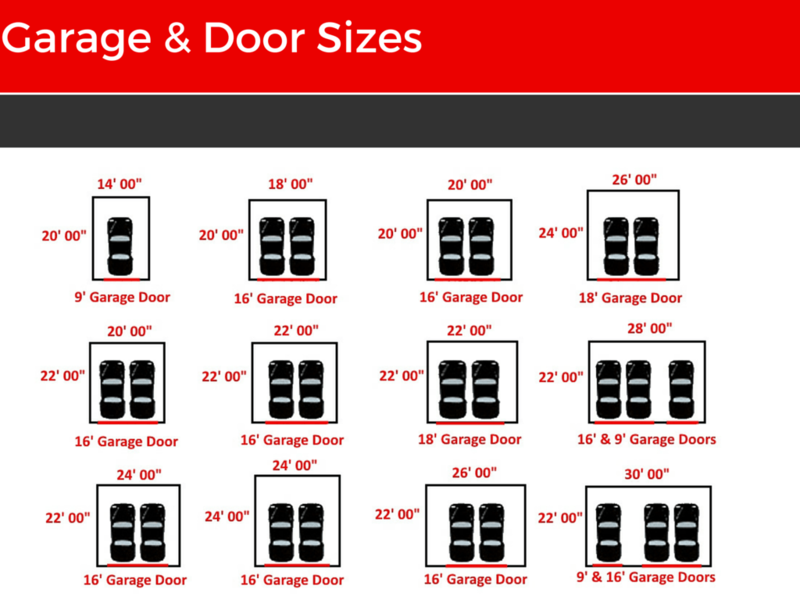 These are the most standard garage door sizes, and they are a perfect fit for standard homes. This size is good for one car, small truck or a van. It’s a great choice if you don’t plan to store a lot of items in your garage or switch to a bigger vehicle. Double garage doors usually have sizes of 12’ x 7’, 14’ x 7’ and 16’ x 7’. If you own a big vehicle or just have two of them, this garage door size will satisfy your needs. This one slightly differs from the other two door sizes. To be able to fit a recreational vehicle, the standard RV garage door height is 8’ and the standard width is 16’. Still, you need to be aware of your exact RV size to be able to choose the right door size for it. There’s a wide range of garage doors to choose from. They differ not only in sizes, but also in materials and styles. To make the choice easier for you, let’s have a look at 4 main garage door types. Knowing these types will help you to decide which garage door works best for you. When deciding on which type of garage door to chose, be aware of the standard sizes available for the particular type of doors as well. The size of your garage door depends on the size of the garage itself and on how you’re going to use it. With the right garage door size, you can make the most of your garage and its free space. This door type gains more and more popularity because of its practicality and reliability. The main benefit is that this door doesn’t swing out when opening or closing. The whole door splits horizontally into 4 or more panels and follows the garage roofline. This door type provides a full use of the garage space. A sectional door type also opens higher and you can easily convert it to remote control operation. Wide variety of size options makes this door a perfect choice as a single, double and RV door. Here you can find out about the advantages and disadvantages of sectional garage doors. Sectional garage doors allow for a wide range of size choices. There are 3 reasons for this. First. It folds and moves into the garage instead of just hanging in the opening. This gives a maximum drive through height. Second. The strength of the sectional door panels allow for large widths. It’s possible to install the sectional door to a smaller or bigger opening. It’ll still function normally. Third. Given that the sizes of sectional garage doors are very flexible, the only limit is the maximum available size. Today, the largest available domestic sectional doors are 9.8’ high and 24.6’ wide. How awesome is that? Apart from standard measurements, you need to keep in mind a few more things. Sectional garage doors require 90 mm on each side of the opening to install. To function properly, it also needs around 100–210 mm of headroom above the top door’s panel. As it goes further into the garage on the horizontal rails, you need to have enough free space inside the garage (on the ceiling, of course). It’s the height of the door plus approximately 350–600 mm. Here’s another mechanism that doesn’t swing out during operation. When open, it provides maximum width and height. 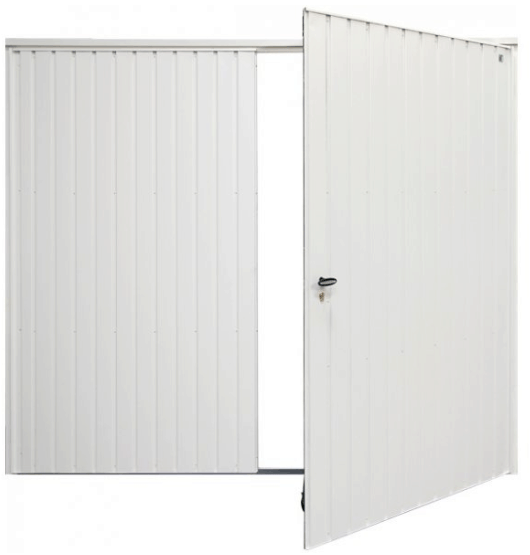 This door type usually uses a motorised mechanism, which makes it much easier to use. It leaves more room and allows you to park very close to the door… and still be able to fully operate it. The roller shutter door is an outstanding RV door, as well as a single or double garage door. 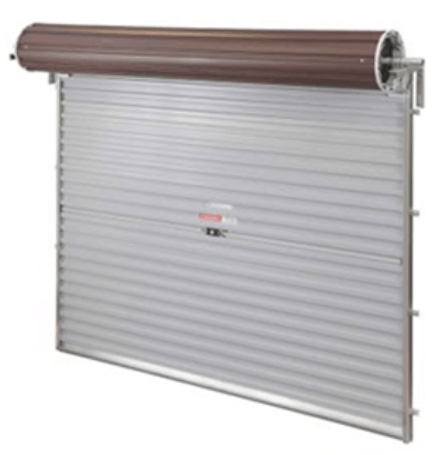 Read this to decide whether you need a manual or electric roller shutter. The curious thing about roller shutter garage doors is that there are usually no stock sizes for it. How can you tell if it will fit or not? Easy! They’re all designed to fit the opening perfectly. 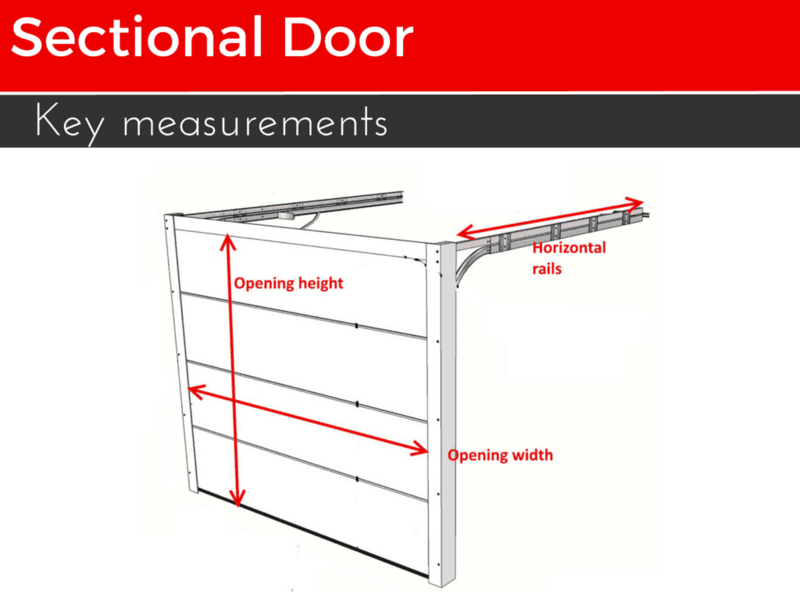 Basically, the determining factor here is measurement (continue reading to find out how to measure a roller shutter door properly). 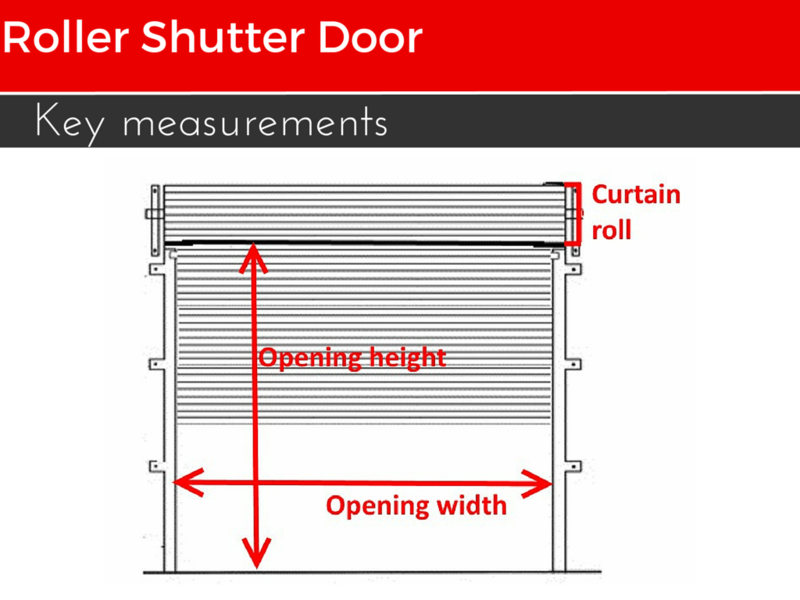 In general, the sizes of roller shutter doors can go up to 9.8’ high and 16.4’ wide. When making measures, you need to be aware of the curtain roll size too. 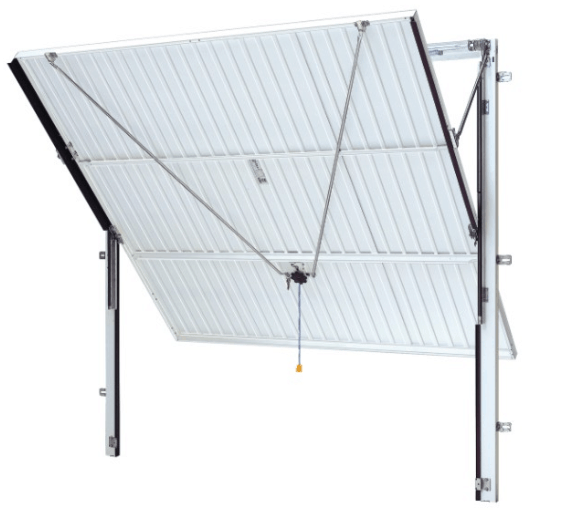 It’s usually mounted above the opening and ranges in sizes between 300–450 mm. There may be smaller, more compact roller curtain sizes, but they usually don’t go below 205 mm. This is another classic type of garage door. It has proven to be reliable and now gains popularity once again. It’s practical and exceptionally simple. The doors usually hinge outwards and don’t take any space in the garage itself. This door type makes it possible to open only one leaf to access your garage. Side hinged doors last longer because they have the minimum of moving mechanical parts. It’s a perfect option for those who often need quick access to the garage. It makes a good single garage door. And it works even better for vehicles other than the car. Keep in mind that side hinged doors usually go in between the opening and have their own frame. What does that mean? It means that the ordering size usually references the actual opening of the doors (inside sub frame), not the overall size. Side hinged doors have a very simple and practical construction. Opening sizes can normally go up to 8’ high and 10’ wide. Still, it’s possible to have a larger size. In this case, though, a side hinged door acts more like a gate. This is because leaves and frame are larger and there’s more weight to it. 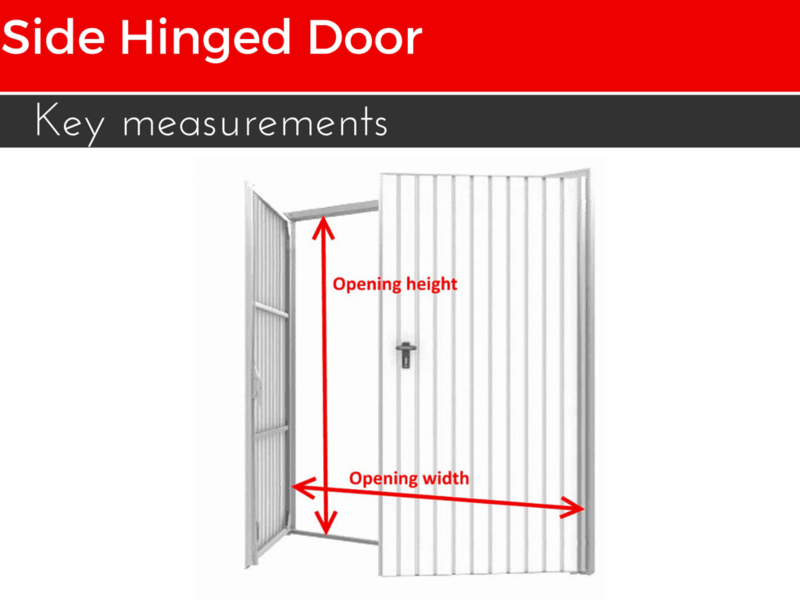 Measurements for side hinged doors are similar to those of up and over doors. All you need to know is the width and height of the opening. It’s that simple and straightforward. Remember, though, that there’ll also be an inner frame, so the actual opening of the door is going to be slightly smaller. This type is one of the most popular ones. Why? Because this garage door is easy to install. The simple construction consists of a one-piece panel, so it’s easy to use too. The canopy mechanism provides a full drive through width when open. You can also convert it to use with the remote control. The up and over type serves best as a single garage door for one car. You may find these tips useful when installing an up and over garage door. When deciding on the size of your up and over garage door, always remember that it requires a fixed sub frame for installation. So, when you mention the size of your up and over garage door, it’s the size of the actual frame opening. You also need to consider that when the door opens, the door panel hangs down in the opening. Why is this important? Because it reduces the drive through height. The optimal width for an up and over garage door is 8’00”. This size allows easy access of a vehicle. The height depends on building restrictions or the height of a vehicle. It usually stays close to 7’00”. 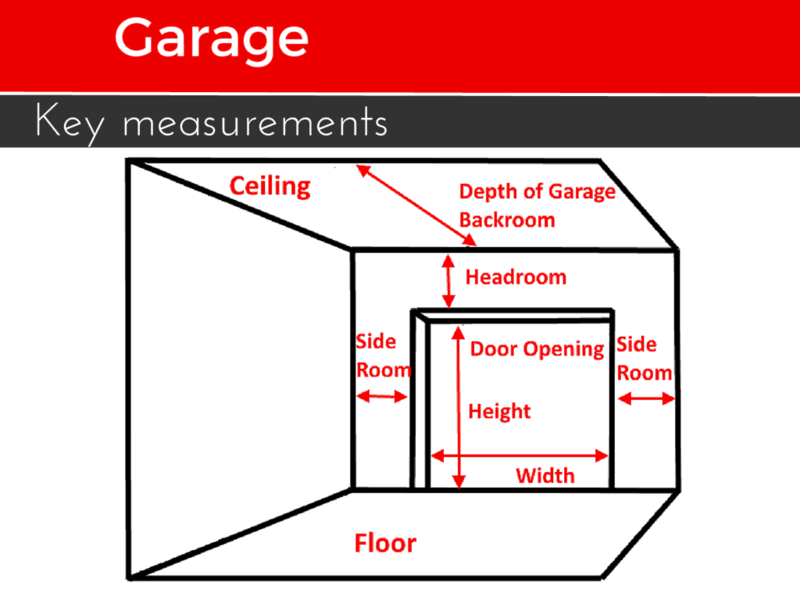 Measurements for up and over garage doors are quite simple. In most cases, all you need to know is the height and width of the garage opening. Although, there’s one thing to keep in mind. Measurements do differ depending on how exactly you want to install the door. 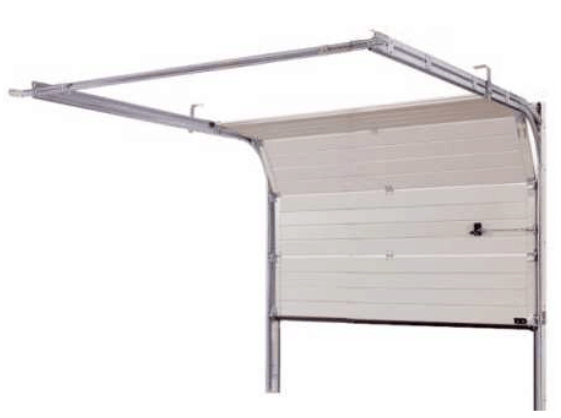 An up and over garage door has an inner frame and operating gear. It will take up extra space, so the actual opening will be smaller. Frame legs are usually around 60 mm wide. Installing the door behind the opening gives you more freedom. It lets you use all of the opening width. 1. 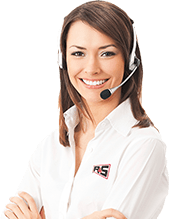 What are the garage door prices? Garage door prices vary depending on the size, strength, used materials and design. An average 16’ x 7’ door starts at between $800 and $1500. An automatic door opener adds an extra $200–$500. 2. What are the commercial garage door sizes? The most common commercial garage door sizes have 24’1” height and 32’2” width. The size largely depends on the truck sizes that will go into the garage (it’s better to take measures of the largest possible truck). The number of trucks is also important. 3. What are the standard garage door sizes? Standard garage doors usually have the sizes of 8’ x 7’, 9’ x 7’ and 10’ x 7’. These sizes are perfectly suitable for normal homes with a typical car parked inside the garage. If you want to store a lot of your belongings in the bigger garage, you might want to have a bigger door too. 4. What is the minimum headroom size? The minimum size of headroom required for proper door operation is 12”. A garage door opener will take up an extra 3”. The required size depends on what type of spring system your garage door will have. 5. Do I need an insulated garage door? An insulated garage door reduces the cold temperature inside the garage. If you need to maintain a warm and comfortable temperature, you’ll probably need an insulated door. You should also install an insulated door if you don’t want cold air to travel from your garage to your home. Usually, an insulated door is also more quiet and has more varied designs. 6. What are the advantages of a steel garage door? A steel garage door is more energy efficient, offers better value, security and strength. Modern steel garage doors cost less because of advanced manufacturing. They’re available in numerous designs and colors. 7. Can I paint a steel garage door? You can paint a steel garage door using latex paint. Don’t use oil based paint as it causes the original color finish to peel off. You also need to make sure that your garage door is dry and clean before starting to paint it. Also, remember that painting adds much weight to a garage door. It can affect garage door springs, its performance and performance of the garage door opener. 8. How to choose the best garage door? Apart from choosing a door type, you need to decide what material you want, choose a design and energy efficiency level. The garage door takes up a large chunk of your house’s front facade, so it’s better when it suits the overall exterior. And, of course, make the right measurements. 9. Do I need a lock on the garage door? If you have a garage door with an installed electric door opener, then the lock is unnecessary. You should make sure if the door is impossible to open from the outside if you have an old electric door opener. If there’s no electric door opener installed, you’d better buy a lock. 10. Should I use torsion or extension spring? Torsion springs offer better balance to the door and provide more safety to those who use the door. They also operate much smoother and last longer. 11. When is it time to replace the garage door? Obviously, when your garage door doesn’t operate right – it’s potentially hazardous. Instead of fixing it on your own, it’s better to call professionals. Sometimes buying a new garage door brings more value than trying to repair an old one. 12. The garage door is too noisy. Is it a reason for concern? Usually, it’s the rubbing of old spring coils against one another that causes the excessive noise. It doesn’t mean that the door is unsafe. And you can get rid of this noise. Use a spray-on lubricant or run a thin bead of motor oil from the top to the bottom of each spring. 13. How long can a door opener last? An average electric garage door opener can last from 10 to 20 years. It depends on its model and how often you use it. If maintained properly, some garage door openers can last up to 25 years and even more. When an opener breaks down, you should consider its age to decide whether it’s worth repairing it. It may be better to buy a new one. 14. What cycle of torsion springs should I choose? Torsion springs for garage doors usually have 4 different cycles: 25.000 cycles, 50.000 cycles, 75.000 cycles and 100.000 cycles. To decide which one is better for you, you need to do the counting. Take the number of how many times you open and close the garage door during the day. Multiply this number by 250 days. Then multiply again by 10 years (an average life cycle of a garage door). The number you’ll get is the cycle of a torsion spring you need. 15. What maintenance is required for the garage door? A garage door is a large, heavy and moving part. It’s bound to fall out of its adjustment during daily use. The most common problem is that it’s harder to open and close the door over time. You can do visual inspections and check all the moving parts and mechanisms. If the door has an electric door opener, disconnect it and try to open the door manually. It should operate smoothly and with a little bit of resistance. Also don’t forget to lube up the springs, hinges, rollers and tracks. Did we cover all questions about garage door sizes? Is there anything that should be added? Share with us in the comments below!